Reading, anime, mlp, and acting. I also anjoy creative writing and creating song parodies. "Oh! I'm so sorry! I didn't see you back there!" Cheerilee said to Chysalis. "Please introduce yourself!" Siren chuckled a bit at Fresco's introduction and politely listening to the others. At Pawn's intro, Cheerilee sweatdropped and smiled uneasily. "Um... would you care to elaborate more on you?" "All right class, before we begin, I want each of us to go around the class and introduce oursel-" Before Cheerilee could finish Siren shot out of his seat. "Hello! I am Air Siren! I love the outside, big buildings and talking with others! 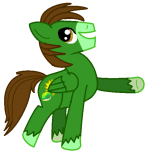 I don't have a cutie mark yet, but I think I'll get it soon!" Siren gave a confident smile. "Okay..." Cheerilee nodded slight before looking back to the class. "Who would like to be next?" @MicDaMicrophone Say somepony wrote a parody, and they would like you to sing it... where would be the best place to send it? "Good morning!" Cheerilee replied happily to the new filly. "Please get to your seat so we can begin!" Cheerilee gave Knight a smile. "That is excellent news Knight! I must say, it suits you well. Now hurry to your seats and we can officially begin the new school year!" The school bell rang and a pinkish purple earth mare walked into the class room. "Okay, my little ponies! Take your seats!" She said in a happy, upbeat tone. Siren looked from the teacher to Chrysalis. "I'll talk to ya later!" He nodded as he quickly grabbed a desk by a window. Cheerilee walked to her desk and opened her book to reveal the faces of all the children she had to teach this year.